CAAC Administrator Feng Zhenglin addresses the conference. Eight projects are signed on-site. On September 27, Promotion Conference to Encourage Private Investment in Civil Aviation was held in Beijing. Eight private investment projects that have already confirmed the private investors including E'zhou Airport, etc. were signed on site. The conference also introduced 13 other projects, such as the supporting projects of Beijing Daxing International Airport, to participants. 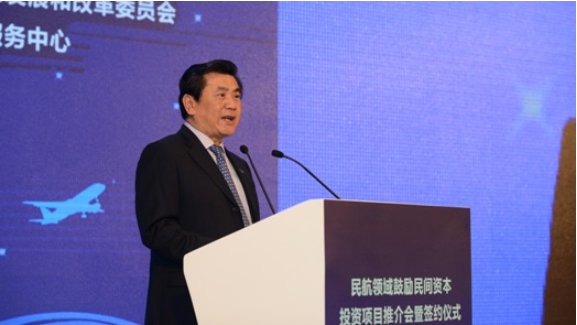 CAAC Administrator Feng Zhenglin attended the conference and delivered a speech. Deputy Administrator Wang Zhiqing presided over the meeting. The conference was also attended by Vice-Governor of the People's Government of Hubei Province, relevant officials of National Development and Reform Commission (NDRC), All-China Federation of Industry and Commerce, China Council for the Promotion of International Trade, as well as representatives of provincial, municipal, and local people's governments, CAAC and its Regional Administrations, enterprises and institutions. It has been put forward in the 2018 Report on the Work of the Government that the policy to encourage private investment should be put into practice. Attractive projects in fields such as railway, aviation, oil and gas, and telecommunication should be opened for private capital. On August 22, CAAC and NDRC issued a List of Civil Aviation Projects to Encourage Private Investment, including all together 28 projects worth 110 billion yuan. 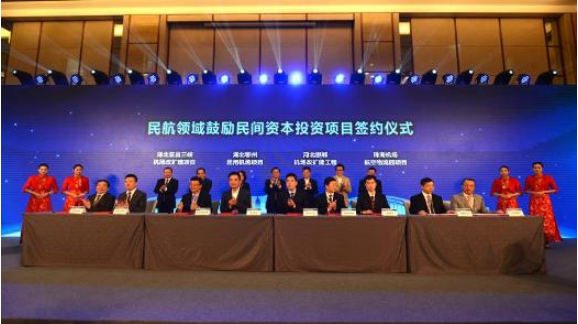 By holding this promotion conference, CAAC aims to accelerate the implementation of projects that have already confirmed the private investors, and to introduce projects that have clear profit modes, great potentials for developing new business models, ability to improve the quality of industry development and solid early stage preparation, to attract more private capital. Feng Zhenglin pointed out that the importance attached to private investment results from national development, and is an experience gained by civil aviation reform and opening up. In 40 years of reform and opening up, civil aviation has adhered to market orientation, and was the earliest industry completely opened for private and foreign investment. As an important and strategic industry of China, civil aviation has played a leading role in the Belt and Road Initiative, and the strategy of building China into a civil aviation powerhouse in the new era has brought about a great amount of opportunities for private capital. The chances provided by the rapid development of civil aviation, fundamental construction, general aviation, transformation and upgrading of civil aviation should all be seized. Chances should be taken to carry out cooperation that can bring about mutual benefits and to boost high quality development of civil aviation. During the conference, project initiators and private investors signed contracts on site, including projects of Hubei E'zhou Airport, Hebei Handan Airport, Hubei Yichang Sanxia Airport, the air logistics park of Zhuhai Airport, Zhejiang Wanfeng General Airport and industry park, Zhejiang Jinhua Hengdian General Airport, Qinghai Guide General Airport, and Jilin Changchun Nong'an General Airport. The conference also introduced 13 projects to the representatives, including the mixed ownership reform of freight logistics of the Aviation Industry Corporation of China and the supporting facilities of Beijing Daxing International Airport. There are three ways for private capital to invest in civil aviation. First, NDRC and the State-owned Assets Supervision and Administration Commission of the State Council are pushing forward the mixed ownership reform and the Double Hundred Action Plan, where private capital can participate in the state-owned enterprise reform. Second, by means of public-private partnership (PPP), private capital can engage in civil airport construction, or invest in operational items of airports through direct investment or becoming a shareholder. The third is to invest in emerging fields such as general aviation, equipment manufacturing, and technological innovation through sole proprietorship or joint venture, and give full play to the advantages of fund raising, management model innovation, and technology R&D. At present, all areas of civil aviation have been opened to private capital, and private enterprises have become an important part of China's civil aviation industry. In China, 15 of the 58 air transport enterprises are wholly privately-owned or privately-controlled; more than 230 of the over 400 general aviation enterprises are private enterprises; nearly 50 of the over 160 enterprises that have gained certification of civil aviation construction are private enterprises; 15 of the 22 pilot training schools are private enterprises; and more than 200 of the over 500 aircraft maintenance enterprises are privately owned.